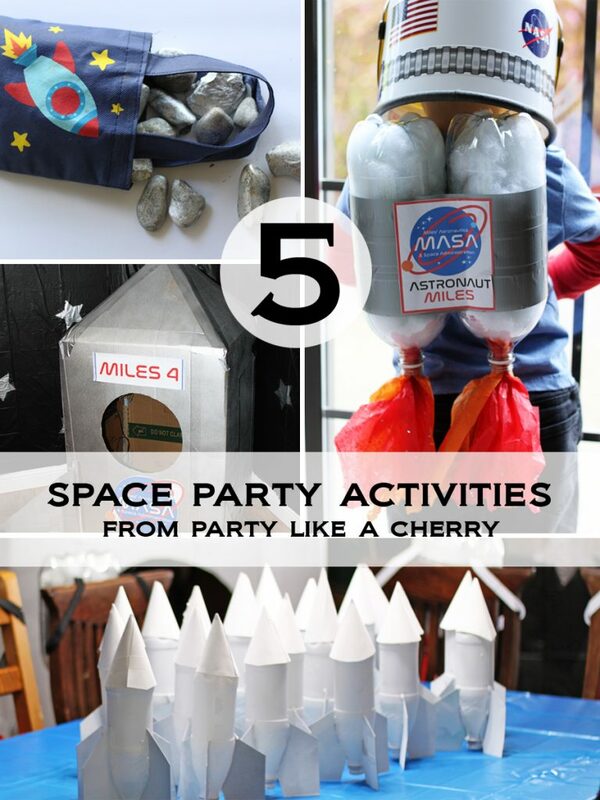 Today I’m bringing you all the deets (yes… I just said deets) on our space party activities. Have you ever been to a party that had a pinterest-perfect dessert table, but nothing was really planned or scheduled? And the kids just ran wild and the host looked a bit hazy-eyed? Dessert tables are pretty and all (and very instagramable, so more appealing to prepare) but in my humble opinion, the activities are the most important part of a children’s party. If you are running short on time and/or energy, focus right here on the activities! I think its important to always have a “welcome activity” (usually a craft). That way you have a place to direct people as they arrive. They can take their time, or they can rush through it and start playing (there are always both types in my experience). These water bottle rockets ended up being a last minute addition to the party. 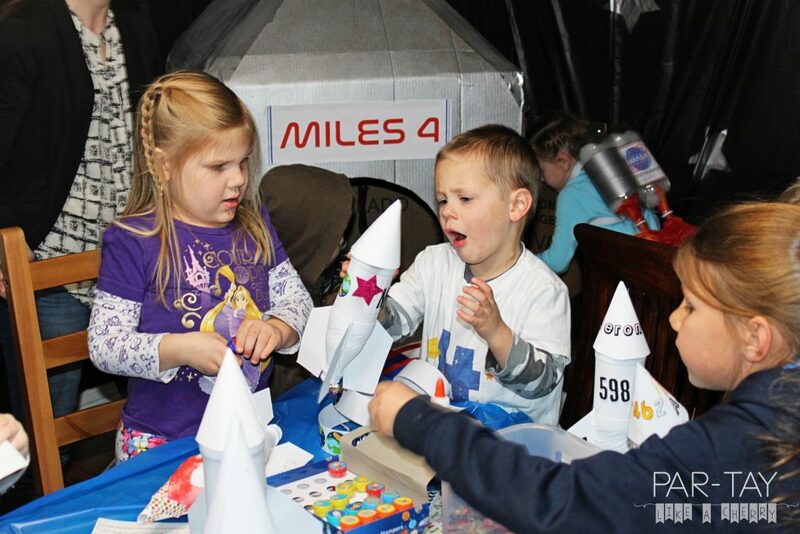 I was intending to just have a bunch of water bottles, construction paper and stickers and I was going to let them make their own rockets to keep people occupied as people were arriving. I knew that it was going to take a lot of parent-involvement (since my guests were mostly 4 year olds) but I was just going to see how it went. 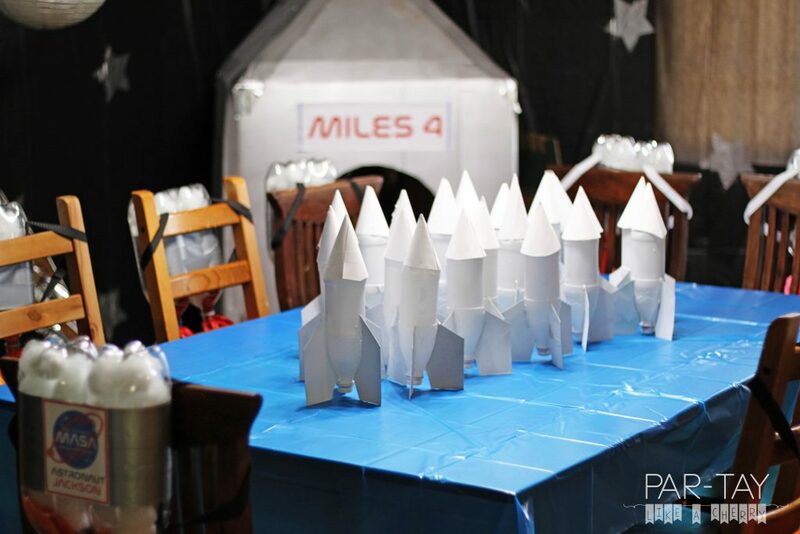 Last minute, I decided to make all the rockets and so they only had to decorate them. I learned an important lesson!! The size and shape of the water bottle is VERY important. The first bottle I used was a Dr Pepper bottle. I made some template fins out of a cereal box, hot glued them on, and used cardstock for the cone on top (also hot-glued on). 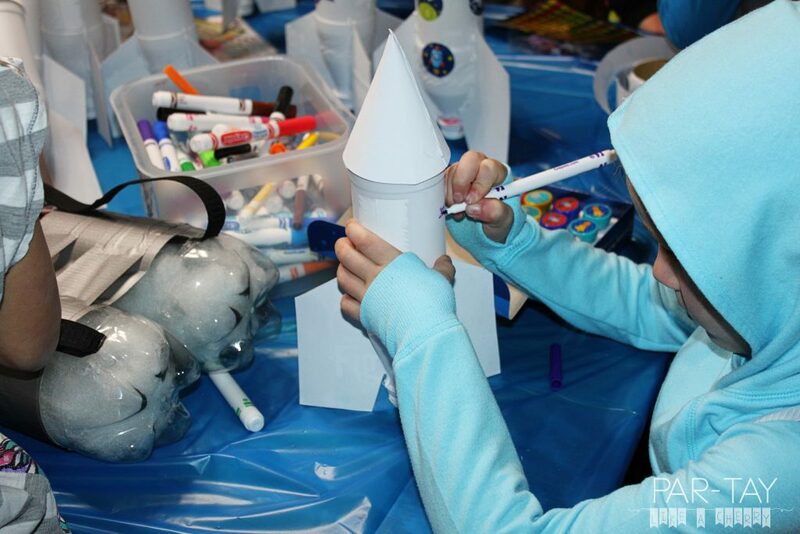 Then I moved onto the next rocket which was a Dasani water bottle. NOPE! My fin template did not work AT ALL! I quickly realized that although all the bottles looked pretty similar, just a little difference in shape threw off my template so it wouldn’t fit snugly against the water bottle anymore. After getting really frustrated trying to make a new set of fins for every different type of bottle, I finally thought “forget this” and went and bought 20 matching dr pepper bottles. I only had a couple days to drink them all (and I am not a big soda drinker) so I enlisted the help of family and friends and got them all emptied ;). Definitely get a set of all matching bottles! It will make your life so much easier. Once I got them all glued and assembled, I took them outside and sprayed them with matte white spray paint. This made a nice blank surface for them to decorate. I put out markers (they worked alright, not great. Sharpies would have been better but I wasn’t that brave), stickers and stamps. I also had a bunch of letter and number stickers in my craft collection that I put out. Birthday boy mid-rocket sound effects. It would have been fun if we got a chance to shoot them off. Darn rain. (I talk more about that below). This was only about half the crew! 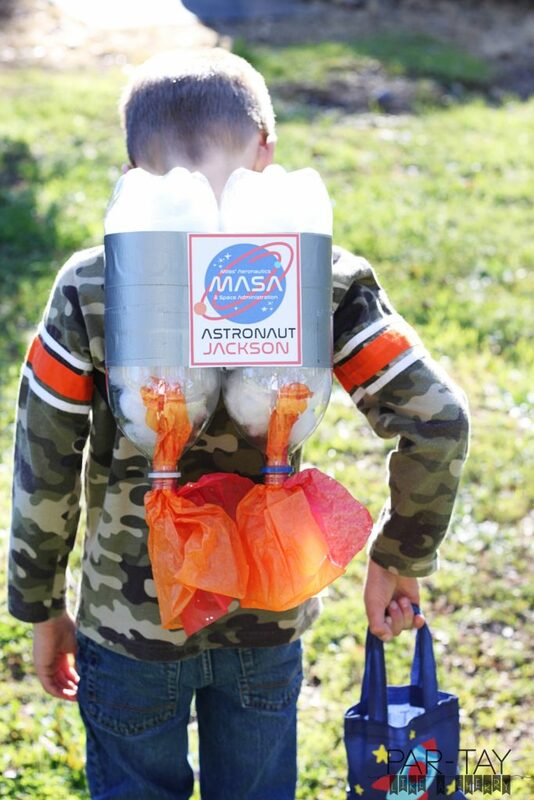 The other half was running around the house with their jet packs. With every party I have my “baby” that I am so proud of. 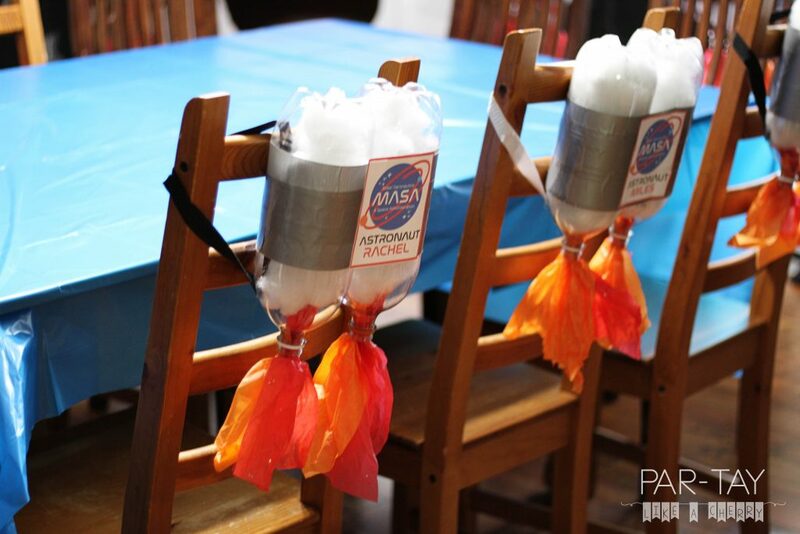 The jet packs were definitely it for this party! 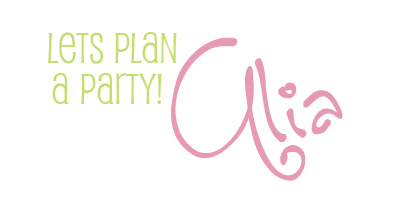 I saw lots of different versions on Pinterest, and it was actually this concept that launched the whole party theme. 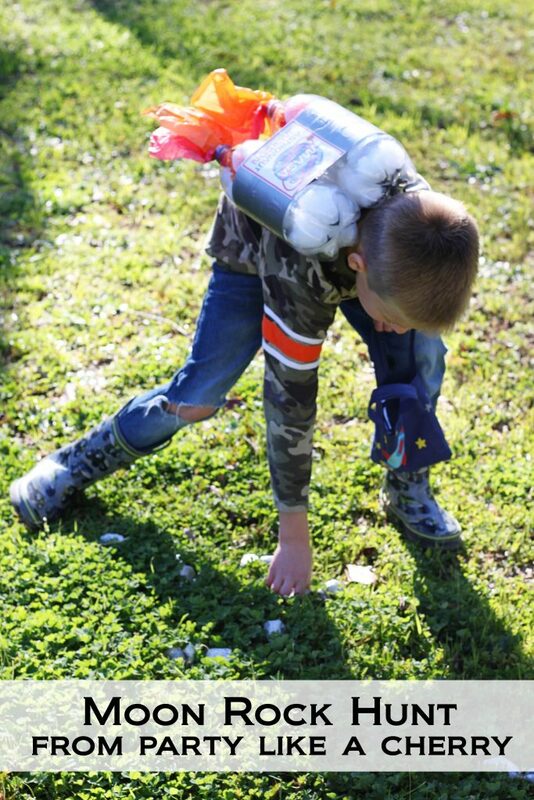 I ended up deciding I wanted to make a jet pack for every child at the party. It was an undertaking, but I think it was one that paid off. 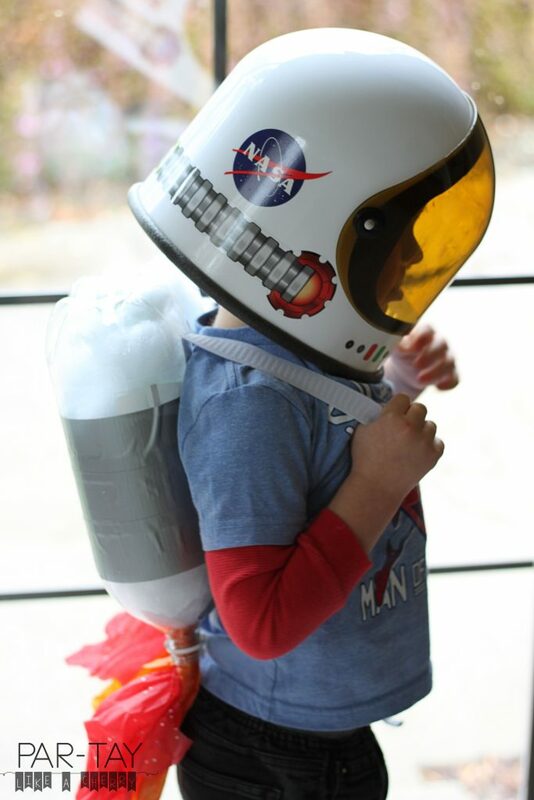 The kids were thrilled they had their own jet packs (with their names on them!). Collect 2 liter soda bottles. Size and shape matters! The funky shaped ones are a lot harder to use so try to stick with the regular shape. In fact, I found the BEST soda bottles ended up being the cheap generic store- brand soda. The labels were a lot easier to get off and the plastic wasn’t as thick, which made it easier to cut and slip the elastic through. We actually aren’t really soda drinkers in our family. So I put it out on facebook about a month in advance and asked family and friends to save their bottles for me. Remove label, wash & dry bottles. Pretty self explanatory. Duct tape bottles together. You want to do about three rows of duct tape. It looks better (and is more sturdy) PS you need A LOT of duct tape. Like probably more than a roll. Cut slits with Xacto knife in the top and bottom of each bottle. Use your child to get a template for how long you want the elastic straps to be. This took some trial and error, but once I found a good length, I cut all the elastic straps to match and put them in a big pile. I did end up making two sizes, with a few that had a little bit longer straps for some of the older kids. The 3/4 inch elastic worked well. I would say you need roughly about 1 yard per jet pack. Stick elastic through the top slit and then fish it through and pull it out the bottom slit. <— this ended up being the trickiest part. And only because the cut plastic is sharp and I got a few cuts. It wasn’t until like Jet Pack number 15 that I got the bright idea to use tweezers (instead of my poor cut up fingers) to pull the elastic through the bottom slit. DUH. That made it a lot easier. Duct tape the edges around the elastic straps. This is optional but I was kinda worried that with some rough play the slits I had cut would continue to tear and then the jet packs would be ruined. So I reinforced them with some duct tape. 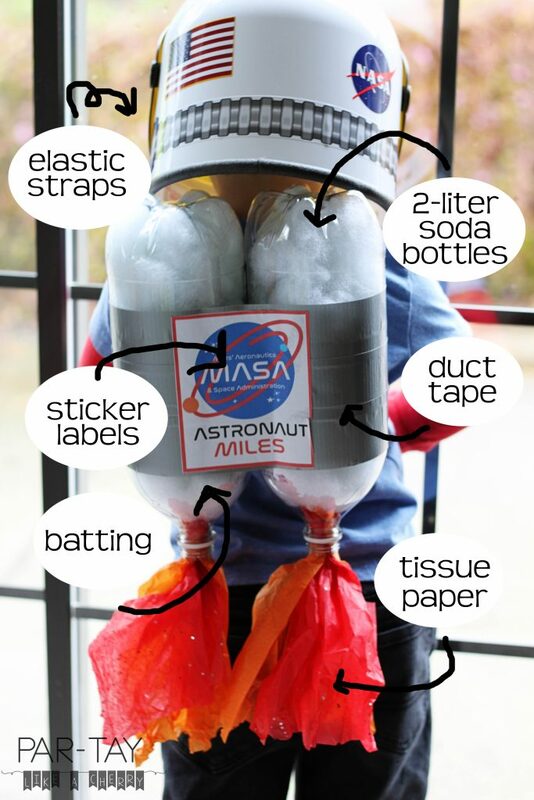 Fill bottles with batting like this stuff. As it turns out, this makes an excellent task for 8 & 6 year olds. And when they complained that their fingers were tired I replied, “WELL TOO BAD BECAUSE NOW YOUR BACK’S GONNA BE TIRED, YOU JUST PULLED LANDSCAPING DUTY”. Haha, jk jk. I gave them a cookie break and told them to keep at it. Stick tissue paper in the bottom. A little goes a long way. I would use colors like red, orange and/or yellow. 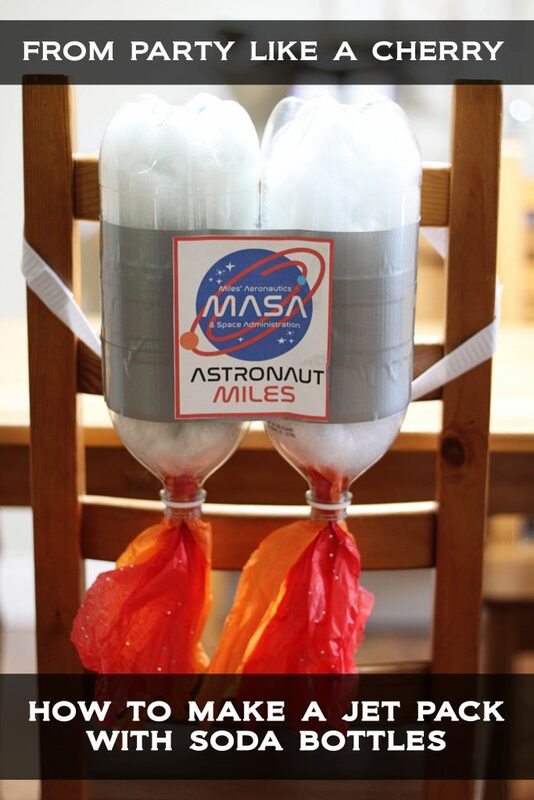 You don’t need much, just one or two sheets per jet pack. I didn’t adhere it in any way, just shoved it up there, it stayed just fine for the most part. Add the labels! This was the fun finishing touch. I have generic labels you can download at the end of this post, or if you would like to have them personalized for $5 just email me @ partylikeacherry@gmail.com. This is also included in my $25 space party pack (more details on that below as well). 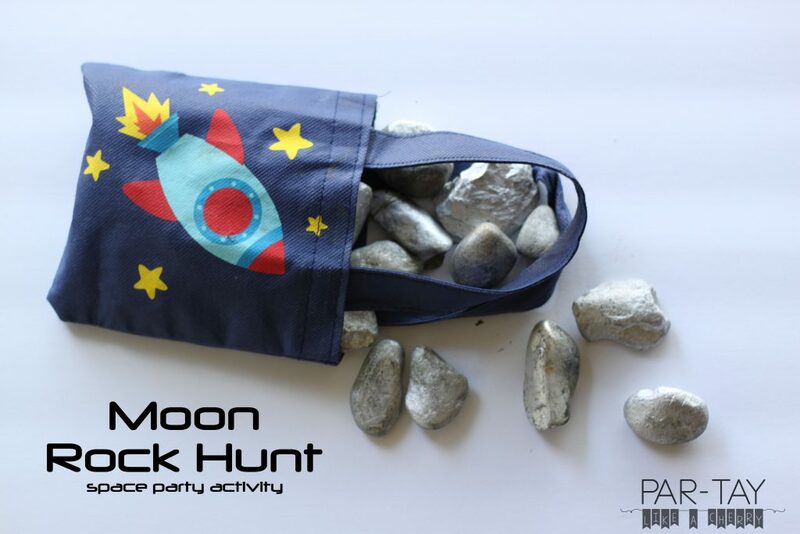 There are so many different ways you could orchestrate a moon rock hunt. 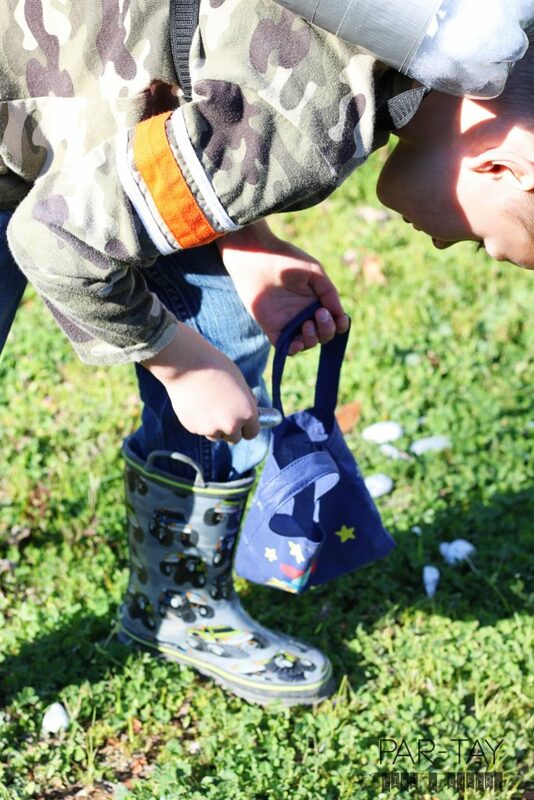 You could fill easter eggs with candy and cover them in aluminum foil. You could purchase plastic gems & stones and hide them. I had left over metallic spray paint from the backdrops and the rocket ship, I also have a plethora of rocks as we live on a gravel road. So I decided to just round up about 200 rocks and spray paint them silver. “Hiding” the moon rocks turned out to be another excellent task for my 8 & 6 year olds. I sent them out in the yard the morning of the party to disperse them. It actually rained during the party (the only part of the whole day it rained!!) but it was just a light drizzle, so I sent the kids out for the moon rock hunt anyway (we just had to skip anti-gravity training on the trampoline because it was too slippery). I tried to have them take turns blasting off in the rocket and then “landing” on the moon and then told them their mission was to go collect geological samples that we could study back on earth. But things got a bit chaotic and my whole “adventure to the moon” idea didn’t quite get carried out. But If you have a smaller, or older, group it would be fun to really milk it. As they headed out the door I handed them these cute bags. I got some metallic paint pens and added their names so as to try to avoid fights over whose loot was whose. I just let them roam free for a bit while I re-composed myself and got ready to feed everyone inside. I had to stage these photos after the party since it wasn’t exactly photo taking weather that day. Just keepin’ it real with ya’ll 😉 What a cute model, eh? All the details on my rocket ship can be found over on this post. 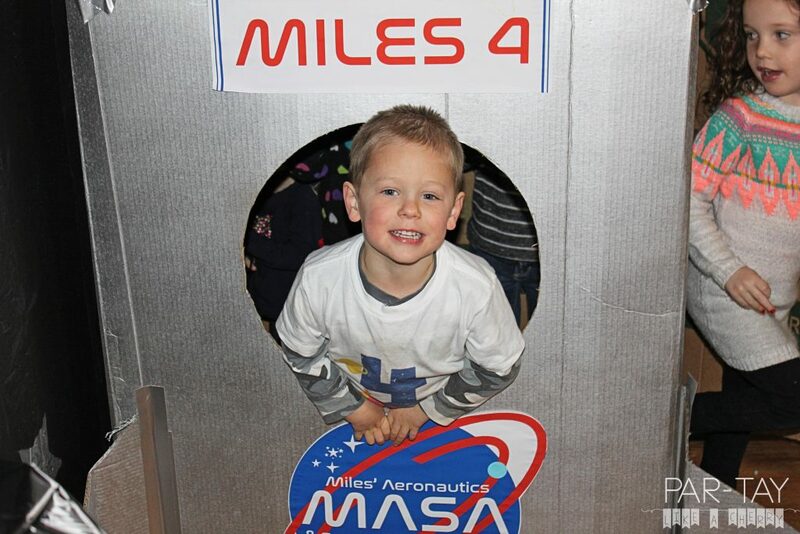 But I wanted to mention it here, as it was a big part of our “pretend your an astronaut” imaginative play that the kids played throughout the party during all the down time. They were all constantly in and out, blasting off, pushing buttons (I had a keyboard inside) and exploring the galaxy. Flat White Spray Paint <— make sure you get one that bonds to plastic, like this one! Can I just say I REALLY appreciate when you make your amazon purchases through my affiliate links (all linked in the post above). It doesn’t cost you any extra, but I earn a (very) small commission which helps me to offer all my free printables. THANK YOU! Please take a second and follow me on social media before downloading these fun jet pack labels- THANK YOU! Pinterest/Facebook/Instagram (PS- I have more details and a tour of the space party saved to my Instagram Highlights). And if you would like to purchase the personalized version of these (like the ones in the photo below) for $5 just email me @ partylikeacherry@gmail.com. 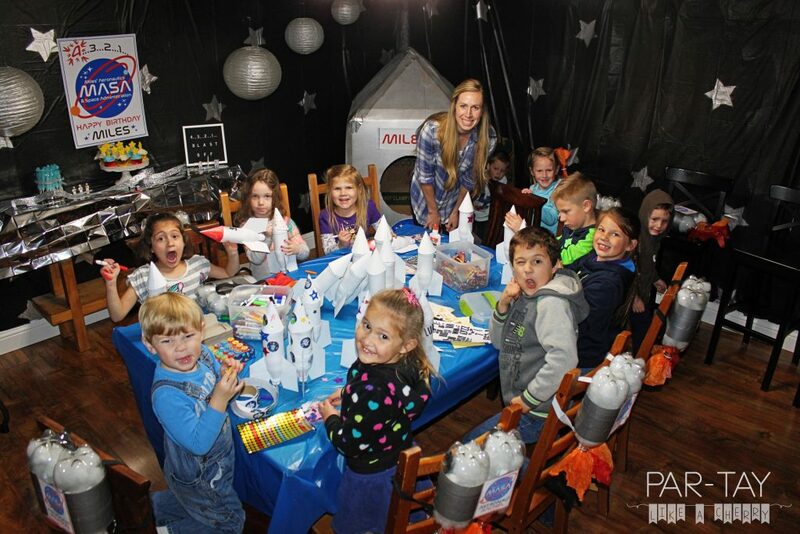 Or alternatively you could purchase the entire space party pack for $25 which includes: invitation, party favors, jet pack labels, poster, and menu printable (all personalized and edited to your specifications). All orders can be placed via email and once you approve the designs I will send you a paypal link for payment.